The Kensington Blue Bells in 1950-51. Oliver is in the second row, first on the right. Photo courtesy of Len Oliver. Len Oliver’s series about playing soccer in Philadelphia in the 1940s and 1950s continues with a look at amateur soccer. Club teams normally moved up to the Second and First Division amateur ranks in Philadelphia. Our Lighthouse Junior team took a different path. We left the Lighthouse Club to play under the banner of the professional Philadelphia Nationals. We played as the Fairhlll S.C., kids playing against seasoned veterans, many who had learned soccer in their native lands. Whenever l am asked today by anxious parents if their kids should “play up,” I give the Fairhlll S.C. example. Some of us were only 16 years old playing against 30-year old men. We won the Second Division and then went on to win the citywide, prestigious Palmer Cup, symbolic of soccer supremacy in amateur soccer in Philadelphia. We often trained with the Philadelphia Nationals, observing and emulating the pros, and our skills and sense of the game grew apace. We never discussed tactics. By this time we had adopted the stopper or “Third Back,” known as the “W-M” system, a change introduced by Charlie Buchan, skipper of the great Arsenal teams in England in the early ‘30s. The W-M was designed to counteract the new Offside Law, and lasted for three decades until the Brazilians introduced the world to the 4-2-4 in the 1958 World Cup in Sweden. As a young GI, I saw Brazil play in that World Cup in Gothenburg, marveling at their skills with the ball, their dexterity, and their unusual formation with only two halfbacks. Without coaching schools, soccer newsletters, papers like Soccer America and the NSCAA’s Soccer Journal, and almost all volunteer coaches–ex-players who coached from intuition—innovations took a long time to become reality. Soccer traditions die slowly, as we see even today as FIFA tinkers with the laws to increase scoring. Just as today, whole families involved themselves with soccer, but it was still a male-dominated sport. 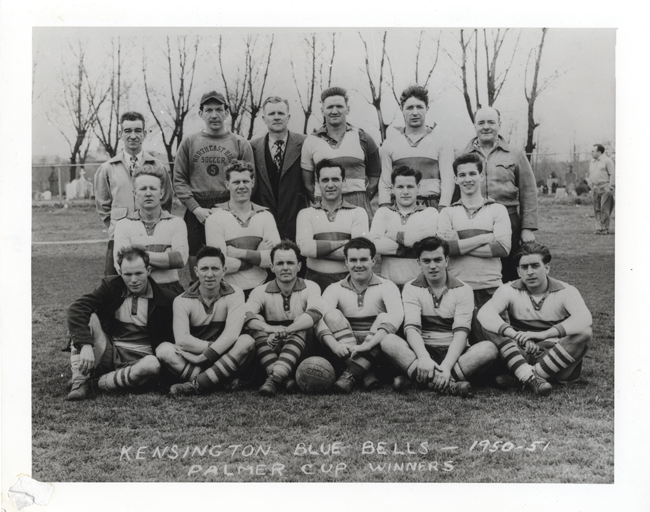 When the Fairhill S.C. met the First Division champion Kensington Blue Bells in the Palmer Cup Final in 1950, we were the kids playing against the team of our fathers and uncles. The final, played at old Holmes Stadium went into double overtime when the younger legs prevailed 5-3. Our fathers and uncles talked about that game for years. It eased the pain when some of us first-generation Scots-Americans played for the Blue Bells the following year. The Blue Bells discarded their veterans and filled the ranks with the kids. My brother and I were finally united with our father, the Blue Bells’ trainer. We had taken another step up the soccer ladder–all within the Philadelphia club structure. With the Blue Bells in our first year, 1950-51, we were thrown into competition with seasoned players of Italian, Polish, Latvian, Lithuanian, Ukrainian, Armenian, and German descent. Just a few years removed from the end of World War II, soccer in Philadelphia took on an even more ethnic flavor as European immigrants flowed into the city. Many of the players had played top-level competition in “the old country” and immediately raised the caliber of play in Philadelphia’s amateur ranks. We now signed USSF forms, but with no cards and no photos, registration showed a more casual approach to the game than found today. The Philadelphia First Division clubs had their share of characters in those days, seemingly missing from our do-it-by-the-book soccer of today. We seem unable to tolerate strong individualism, with players like “Cocky” O’Kane, whose crossed eyes became disconcerting to defenders trying to predict the direction of his passes. But call him “Cocky’ and you had an immediate brawl. There was “Chippy” McLaren, known for the deadly accuracy of his chipped passes, or “Sox” Flynn whose socks never stayed up, and “Dutch” from Germany. Even the team names had an international flavor–Juventus, Pulaski, Inter, Celtic, and the Polish Falcons. This was a time in the late ‘40s and early ‘50s when the American Soccer League sponsored foreign touring teams, so we could see Liverpool F.C with the great Billy Liddell in 1948 and his long, weaving runs down the wing. But our real heroes were Walter Bahr and Benny McLaughlin, who led the Philadelphia Nationals to three titles in four years, Jack Hynes of the New York Americans, another Hall of Famer, and Ray McFaul and Gil Schuerholz of the old Baltimore Americans. Just a few years later in the mid-’50s, we were playing with Bahr and McLaughlin, the best players of their day. We were playing against the likes of Johnny Carey, great right half of the touring Manchester United and Max Morlock, German international with Nuremberg F.C. Nuremberg defeated the Philadelphia All-Stars in 1955 before 5,000 spectators by an 8-5 score, with Morlock scoring 4 goals against us. As youngsters, like the players on our U-23s and our US National Team today, playing against this level of competition gave us the confidence to take on anyone. In the ’52 Olympic final tryouts in St. Louis, I played with Jack Dunn and Lefty Didriksen from our original Lighthouse team in a tough, two-game series representing the East squad. We played on the same team with John and Eddie Sousa, players I had watched in awe as a youngster when Ponta Delgada came to town. They impressed me with their willingness to share the ball, their soccer smarts with “the kids” in the tryouts, and their encouraging play. I made alternate—and felt proud to be there. Throughout my youth career in soccer, I had played only two systems, either the 2-3-5 or the W-M with the stopper back. The 4-2-4, the 4-4-2. and the 4-3-3 were still to be invented. Coaches were ex-players, and coaching meant putting a team on the field. We always knew what we had to do. We never discussed systems of play or tactical play. With the amateurs we received spending money and even with the pros, we never received more than $35 a game. We were fit, technically adept, and competitive. We loved to play and most of us continued in long careers into our 30s. Club soccer honed our skills, but school and college soccer brought us glory, brought out the spectators, and provided us with the education we needed to have a life beyond soccer. I knew that my pop pop played for the Kensington Blue Bells. I decided to search the internet to see what I could find. When I came across this article, I couldn’t believe my eyes. My grandfather, Hank Henhaffer, is the second from the left in the top row. I printed it out and took it over to show him. He told me all about all the guys on the team. He died, peacefully, this morning and I’m so thankful that I could share this with him before he passed.